I almost cannot believe that I am writing this post. Tomorrow I will set off on the adventure of my life, to Everest Base Camp, and to (hopefully) the summit of one of the world’s great trekking peaks, Island Peak. Since I decided to do this trip I have always felt incredibly nervous about it. So why do it, you may ask? Well there are several reasons why it is happening, and so let me explain. Firstly I needed since doing Kilimanjaro to push myself higher and harder, and this has both of those elements. Secondly I have a love affair with Everest, the whole notion of it, and have become a junkie to books, films, websites about it. I claim to have so far scratched only the surface of it, but I had to go there and see it, it has become a pilgrimage in that respect. Thirdly, it is because of so many people saying that Everest Base Camp is so, well, uninteresting, that I had to do something else to combine it with. I am told that EBC is dirty, that you can’t see Everest itself from there (or not the summit anyway), that it is ugly and featureless. I care about none of those things of course – for me just being there will be the greatest thrill imaginable. Fourth, it is about reaching a peak. If you have followed my blog previously you will know that whilst I don’t spend a lot of time on mountains, my greatest emotions seem to come out when attaining a summit. It can be a small ridge in the Lake District, or a massive climb with fixed ropes and ice axes like this one, but the attainment and the achievement is always the same, and something that I can scarcely put into words. This trip actually is the product of a number of things, most particularly a conversation between me and a friend Paul, of “Darina and Paul” fame from Kilimanjaro (see previous blogs again, or let me know, I can send you links if you ask me nicely :)). 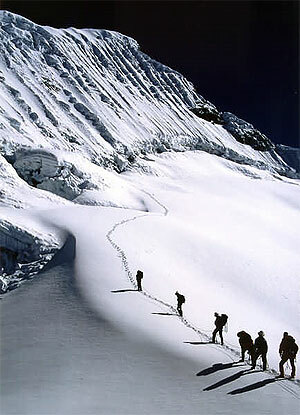 So after we had been skiing earlier this year, Paul said that he’d like to go to Annapurna. I did too, but I felt that I couldn’t go to the Himalayas without at least seeing Everest, it just wouldn’t have been right for me. Paul then said that he wouldn’t like to just go to Base Camp without climbing a mountain, and I agreed, it would be frustrating. So we agreed to not do the trip basically, although then I decided that I just had to go and do it. Paul is now doing the New York Marathon, and will be off there soon (whilst I am away in fact) to do just that. So to Paul (and Darina, and Jason, and Ryan, and everyone else who is doing it) – I wish you the very very best of luck. This trip for me is harder by a long chalk than anything that I have ever done. I will spend over a week at altitudes over 5.5km up in the air. I will be climbing an ice ridge which totally freaks me out. I am so excited about it that I don’t know if I will sleep tonight at all. There will be no more blog posts from me until I return from my trip, as I do not have the means to get them up here live as far as I know. I will do a daily diary however, and will describe to the fullest the things I experience, and this will be posted when I am back. I am going on the same path as that followed by all of the great Everest expeditions themselves, from Edmund Hillary and Tensing Norgay, to Reinhold Messner and Ed Viesturs, and all of the mountaineering greats. I will move from the Dudh Kosi Valley to the Khumbu, passing through evocatively named places liked Namche Bazaar, until I reach the mighty Kumbu Icefall, which is the glacier coming down from Everest herself. When I (hopefully) reach my destination of Island Peak, I will from the summit at around 20,400 feet be amidst (and be staring at) three of the highest five peaks on earth. The words ‘bring it on’ seem sorely and hopelessly inadequate. I hope I am up to it……may I say wish me luck? I decided some time ago (in fact from the start) that my blog would never be about trivia, or even things much more important than that, like relationships and family. Those latter things are the truly important things in life, and putting thoughts down here in a blog about them can firstly never capture them properly, but also is just not a medium for them. Not for me anyway. The only exception I think I have made to this is when on the eve of my trip to Kilimanjaro, I put a post up about my Mam, who had died ten years previously, and I wanted to pay tribute to her, as I was climbing Kili to (amongst other things) raise funds for Bowel Cancer, from which she had ultimately died. I say this as a bit of a precursor to this post, but not an apology for it, as I wanted to record today as an exceptionally sad and emotional day in my life, and one that I will reflect on in my future endeavours and efforts in life. Today the incredibly sad news was announced that Severiano Ballesteros, former world no.1 golfer and five times major winner, died from Brain Cancer, after a long illness stretching from 2008. I don’t remember the last time that I cried, but that happened today. 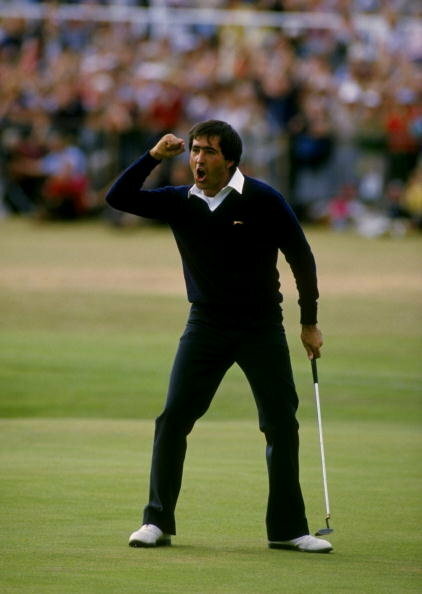 Severiano (or just “Seve” as he was universally known) was an incredible icon, inspiration, and hero to me. I was brought up with golf by my Dad, and was lucky enough to see a lot of golf from inside the ropes as a part time European PGA tour caddie during the mid 1980s. I was also lucky enough to have met him and caddied in the same group as him, when I was caddying for fellow Spaniard Jose-Maria Canizares. I followed golf and Seve’s career quite arduosly, and having been at probably ten British Open Championships from around 1981 to 1990, he was always (alongside my other childhood hero Jack Nicklaus) the one I looked out for on the course. When Jack Nicklaus walked down the 18th fairway the crowds would roar, and give him a standing ovation for his fantastic achievements, and it made the hairs stand up on the back of your neck. With Seve the crowds would follow him everywhere, which was often where he was, so wayward sometimes were some of his shots. And that was the thing about Seve – he was a marvel, a magician, a genius in every sense of the word, but he was also almost ‘human’ – he could sometimes just knock one into the trees like the average golfer. It was then what he did with it when it was there that made him so special. I remember seeing Seve play shots that I thought were impossible – he left me speechless altogether. For me, Seve was also the ultimate professional. It stood him above golf, and above sport. He had flair, yes; talent in abundance; drive and determination in spades. But he also had something else – he fought like a tiger, but was fair and graceful in defeat. He did anything and everything to win, and often did, but was so passionate and majestic in the way he carried himself, at all times. He transcended sport itself in fact, and made not just people who didn’t follow golf follow golf, but people who didn’t like sport at all like golf. He made them like Seve, because you couldn’t not like Seve. He was a true gentleman, and an incredible ambassador for his country, for golf, and for life. He had passion, determination, and was and always will be, a winner. Seve, you are my hero, the person I admire most in all of sport, and I cannot see that ever changing. I haven’t mentioned Kilimanjaro on my blog for a while, but don’t for a moment think it leaves me ever, not even for a day. My blog statistics alone serve to remind me of this every time I log in, as the post “the summit….” or whatever it was called, had way more hits than any other post I did before or since, and so it sits there on the WordPress dashboard. 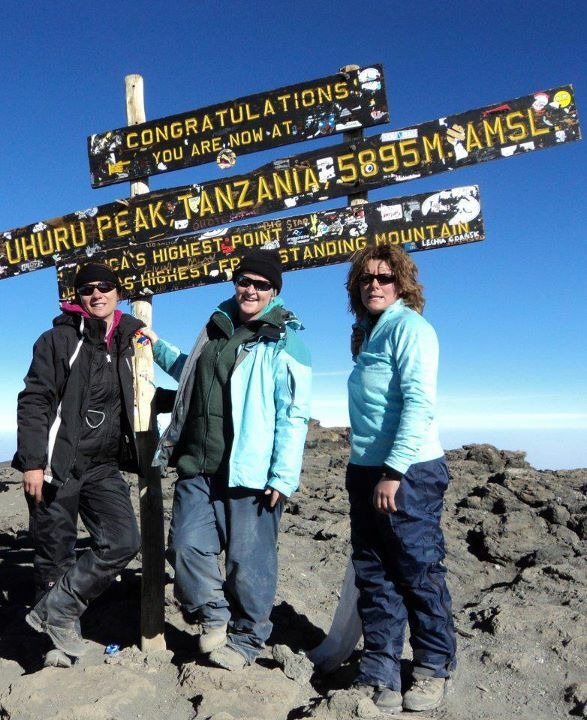 I read the post again tonight in fact, spotted a couple of small typos and corrected them, and I actually cried with emotion at the recollection of Stella Point and Uhuru Peak, and everything in fact. I feel so privileged to be able to say that I did it, and that feeling I am happy to say has not diminished at all. Paul and Darina, who visited me a couple of weekends ago, will be there in about three and half weeks time. I must write about that a little more sometime, but for now I wish them the very very best of luck on their trip. My thoughts will be very much with them throughout. If you happen to be reading this Darina/Paul, then if one of you would be so good to send me a text from the roof of Africa then that would make me very happy indeed. You’re going to make it both of you, I know it. So after yesterday’s little quiz, I have another one for you. Even easier than yesterday’s this one. Ready? Correct – it is a watch. But not any old watch, I promise you. I highlight it here for two reasons. The first is that it is the watch that I wore when I went up Kilimanjaro. 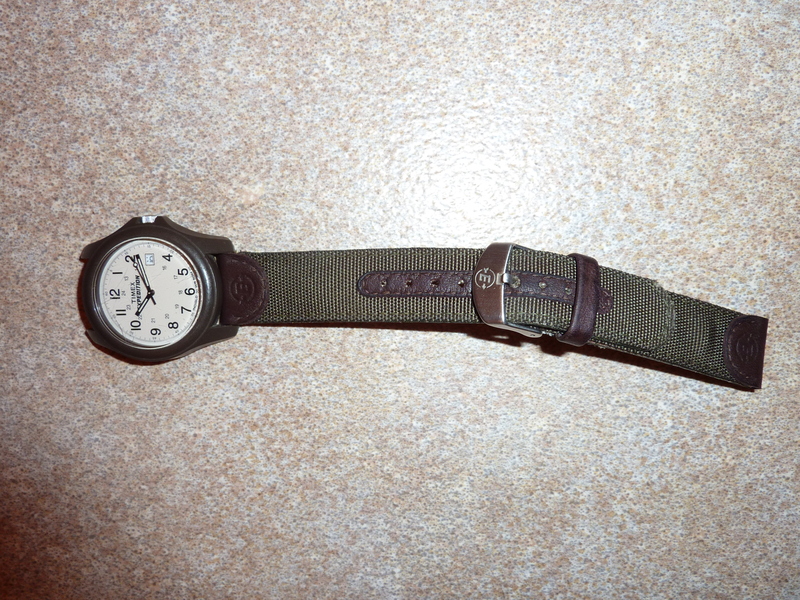 It is just a cheap Timex job, and is very unspectacular. It was cheap, it glows in the dark, and is water resistant. That was all I needed. Today I went cycling at lunchtime from work. The weather conditions were absolutely atrocious, and it rained cats and dogs. Three of us did about twenty two miles, and I have perhaps never been as wet through in my whole life. Stupidly and unfortunately, after about a mile or so in, I turned round to talk to Neil, one of the guys that I was riding with, as he had just taken a mouthful of water from the back wheel of my bike. As I turned back to face the front, my front wheel went from below me on a wet manhole cover. I tried to regain control but couldn’t, and I ended up flying into the kerb where I went over the handlebars and into a hedge and a fence. Having picked myself up again and counted that my fingers and toes were all still there, I discovered two very bloody knees and a few scratches up my arm, and that was it. I was very very lucky indeed. So anyway, the ride continued, and about halfway round I notice that my watch is missing. I was very unhappy. It went up Kilimanjaro with me, and it is extremely special, probably because it is a cheap Timex, and that I bought it for the mountain only. I was wearing it today because my normal watch is broken and needs a repair. At the end of the ride I retraced my steps and searched high and low for the watch, checking the kerb, gutter, pavement, the hedge, and it was not to be found. I was gutted. I returned to the office quite upset, as it was something that I wanted to be able to look at in years to come and reminisce with. After being back in the office for about an hour a few people had said to me that I should go and have my leg seen to, but all I cared about was my watch. I then had to go into a meeting for a couple of hours, and came out wondering whether I should go back one more time and retrace my steps. As I came out, the other guy who had been riding with us, Alain, was holding in his hand my watch, and told me he had gone and searched for it and had found it in the hedge! I have to say, that in terms of a wonderful thing to do, this is off the scale. Firstly it was absolutely teeming down with rain, secondly he is stupidly busy with work, and thirdly it is not his watch. He did it because he is simply a wonderful and kind hearted person, who would give the shirt off his back to make any difference at all to other people. I have been fortunate to work with him for about nine months, and this is just the sort of person he is – utterly selfless, and wonderfully kind-hearted and good natured. I was almost in tears as I thanked him, and I sent him a gushing note to express my thanks, and to which he replied with thanks as his humble, grateful and outstanding self. He deserves more than just thanks, and the world should have more people like Alain Jourdain. Alain, I salute you. my scratches and bruises from today will fade, but the memory of a wonderful act of kindness never will. You are a prince amongst humanity, and so I thank you, truly, from the very bottom of my heart. I can hardly believe that there are just 25 days to go until I get to Lands End for the Great British Bike Ride. It seems rather surreal. I say this as someone who is filled with dread at the prospect of cycling 330 miles – I actually am very unsure as to whether I am physically capable of that at all. I have no idea what cycling more than 50 miles feels like currently, and time is rather running out. I went out yesterday for my first cycle in almost a fortnight, and thankfully felt fine. I thought my holiday would rather have caught up with me (although I did do a few exercise bike sessions in the gym at the hotel, but it was hardly very much), but the legs apparently still work. I did 25 miles, at rather a good pace (averaging 20 mph, my best ever) and so all is back on track as such. I got a call from Mike at the GBBR to ask if I wanted to go on their training weekend on the 13th August, but I have a big family party that weekend which I am hosting, so cannot do it. The weekend will be therefore rather a setback, as it will be no bike riding and probably a lot of vodka drinking (these things have to do be done sometimes :)). So much is happening now as far as the event is concerned, and I have a lot of organising to do. I still need quite a bit of kit, including some extra bib shorts as it is important to have a clean pair for each day, so I had better get the credit card out again. I have to sort out my transport down there too – I am hoping that I can get on the train with my bike, and then I have to work out how I get from Penzance to Lands End – I won’t be able to cycle as I will have too much kit to carry, so it could be interesting. Maybe they have big taxis down those parts…. Oh and another exciting piece of news that I picked up via Richard Hill’s twitter page (http://twitter.com/rhillrugby) – apparently Martin Johnson no less, will be riding day Three (Yeovil to Winchester) with us – how exciting is that? So, with 25 days to go, that means I will be out probably only another 8 or so times in anger on the training front. The last week before the ride we have been told to take it very easy and get some rest before the event. I have only two weekends of riding therefore, and I need to make them count. Tomorrow therefore I am intending to do 80 miles, and then follow it with 60 on Sunday morning. There’ll be a few hills in there too. This will give me a taster of what is to come and how far I need to progress still. It is daunting, but very exciting too. It is interesting how you do progress with time, as the thought of 80 miles just four weeks ago would have terrified me, but now I am rather looking forward to it. OK that’s all for now – off to work, and have just got my head together after an early morning swim in the Thames. Yes you read that right, I must be flipping nuts!